More information to come, please email me to register your interest. Please read information below for pricing and details about getting a puppy from me. These litters are all subject to change and available to approved homes only. If you think you would be interested in any of these litters, please contact me. I have decided to no longer take lists as I find many who ask to go on my list, dont let me know when they have purchased a pup elsewhere, so I end up doing alot of ringing around for nothing. So if you are after a pup from me, please keep an eye on my website, and once I have announced a mating, then you can contact me about putting your name down for a puppy. As it seems that everyone wants chocolate females, you might find you will need to wait a while for one. Please keep in mind that kelpies are great dogs regardless of colour. And kelpie males are just as nice, if not better, than females, especially as you will end up desexing them anyway. Puppy prices for 2018 - $1000 on Limited Register (not for showing or breeding). When you purchase a Suthenskys Australian Kelpie puppy it will be a minimum of 8 weeks old and had been well socialised with its mother as well as any other older dogs I have, as well as friends who come to visit. This will help the pup learn social behaviour in the critical young age. When you get your pup home, you need to expose him or her to as many new things and noises as possible as well as lots of well behaved and vaccinated dogs. Please be aware of off leash areas when your pup is young. On the down side, there is a chance of picking up diseases from dogs not vaccinated and your pup needs to know what 'come' means so you can call it back to you at any time. A lot of bad habits can be learnt from areas like this if handled incorrectly. On the plus side, your pup can have heaps of fun meeting new friends. Your pup will also have been regularly wormed from 2 weeks of age, will be microchipped, had any relevant vaccinations due and started on a heartworm and flea program. Basic lead training and some basic obedience, like sit and come, will have been started as well (time permitting). I highly recommend that you continue the pups education when you get him/her home. Puppy Pre-schools are a great way to socialize your pup while it is still young, especially if this is your first puppy. Contact your local Vet or Obedience School for your nearest Puppy Pre-School. Afterwards you and your puppy should attend obedience classes to further your puppy's education. When the pup is old enough Agility is another great way to have fun and keep you both fit. Australian Kelpies excel at Agility. There is also Tracking and Endurance as well as Herding, which your kelpie was bred for. Also events like Flyball and Lure coursing can be very exhilarating for you and your dog. All these dog sports are a great way to meet people with similar interests as you. If you are interested in any of these when you purchase your puppy just let me know and I will give you all the information you require to get you started. If you are buying your puppy locally, it will come with a few things to help you get started . Like a food bowl, collar and lead, a chew toy, a sample of the food it has been eating, as well as a folder with some paperwork on the different things you can do and enjoy with your kelpie, some membership forms for clubs you can join (including the Canine Control Council for your state). This folder will also include your Puppy's pedigree papers. If the puppy is going overseas, I won't be able to supply a puppy pack but I am willing to supply any information to help out. Your puppy will also come with 6 weeks free insurance with Pet Plan. It will be up to you if you want to keep going with the Insurance. Your pup will be registered on either the Main Pedigree Register or Limited Pedigree Register. If your pup is just going to be a pet or you really aren't sure what the future holds for the 2 of you, your pup will be put on the Limited Register. This will still allow you to compete in all the performance fields, but you will not be able to show your pup or breed from it. The pup can be changed up to Main Register in the future if you decide you would like to show or breed your pup. But again this will only be under special agreement. If you are not going to be breeding from your pup, whether it is male or female. Then I recommend desexing at 6 months old. In females, this will stop those unwanted messy seasons and male dogs hanging around as well as minimizing the risk of cancer and diabetes in your dog (see Jessica's page, I would hate for you to lose your best mate in the prime of his or her life). In male dogs it will help to minimize aggression, dominance and wandering as well as decreasing the risk of testicle cancers. Think of what is best for your dogs well-being not what you would like on a whim. Breeding of dogs is an expensive and risky business. You will rarely make money on it and there is a big risk you can lose your much loved female if she is having complications. Breeding should only ever be taken on because you believe what you are doing will improve the breed, not be done because you think it would be cute to have some puppies. Believe me, kelpie puppies are a handful! Australian Kelpies are usually good eaters and will basically eat anything given to them. be careful not to let your dog get overweight as this will shorten his/her lifespan and cause health problems. If you like to feed your dog a natural diet, there are many books and products available to set you on the right path. The Vets All Natural and BARF Diet products are perfect for this. If you like to keep things simple and just feed dry food, then go for a quality food that doesn't contain colourings etc. Suthenskys Kelpies feed and recommend a grain free premium dry food. Lots of raw meaty bones and chicken wings are good for your dog too and its teeth. You can also feed table scraps to your dog but do not feed cooked bones as these can splinter inside your dog. Fruit and vegies are also good for your dog. 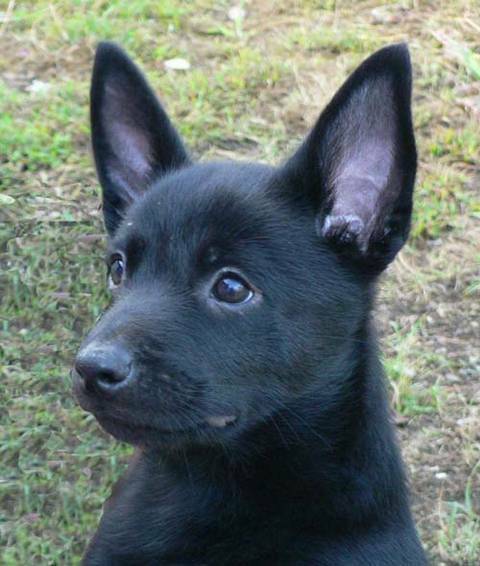 Most of all enjoy your Australian Kelpie Puppy, they are the best companion and mate you can get. Loyal and loving they will always be there for you to cheer you up when you are feeling down or to play a game when you are happy. They make good guard dogs (they will let you know when someone is around) but they are not aggressive by nature and will rarely bite someone. They are great with children but adult supervision is advised as they are a boisterous dog and could easily knock a child over or nip in the heat of a game. Never let any child tease your dog. This can lead to bad behaviour in your dog. For example, pretending to throw the ball then not actually doing so, when this is done too often the dog can become frustrated and might nip to hurry up the game. In my opinion it is not the dogs fault if he nips but rather the person who caused it to happen. The Australian Kelpie is intelligent and inquisitive. They need to be kept busy if alone and love to do things to get your attention when you are around. Make sure if your dog is left home during the day while you work that it has toys to play with and things like frozen bones to keep them occupied for a while. When you get home they will be very excited so make sure you take some time out to be with them till they settle. If you take your dog with you when you go places be prepared as he/she will have to say hello to everyone! The Australian Kelpie adores people and loves being centre of attention.